Around these parts, everyone loves empanadas and you can get them pretty much anywhere. The Cuban kind are usually filled with ground beef picadillo and deep fried. Very tasty, but not exactly light. Argentine empanadas are usually baked and filled with just about anything: tuna with pepper and onions, corn, Mediterranean-spiced lamb, spinach and ricotta, ham and cheese, chicken fricasse, cheese and onion. The list goes on and on. This is what I love about empanadas – there are endless possibilities. 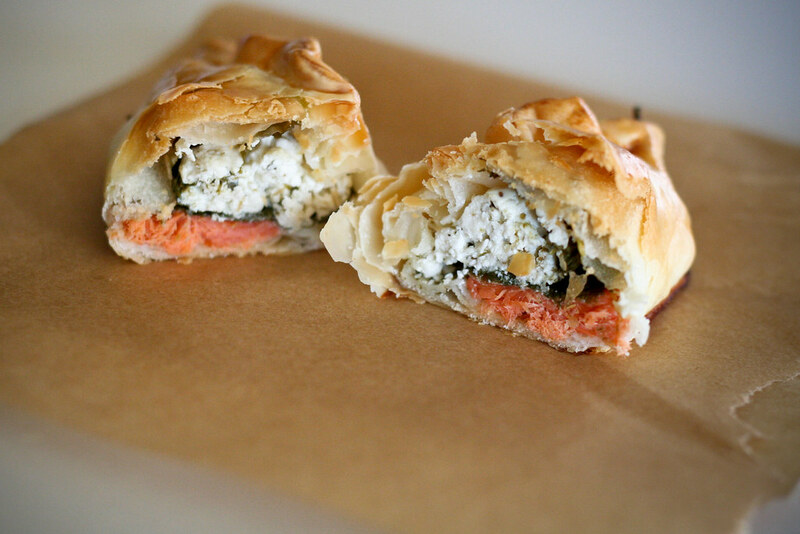 This morning, I stuffed some store-bought shells with smoked salmon, goat cheese and spinach. It took all of 10 minutes to prepare, then into the oven for a half hour. The result? A delicious snack or light lunch. They’d also make a great addition to a brunch buffet. A note on ingredients: I’m lucky enough to be able to find frozen, pre-cut empanada shells at any local grocery store. If you’re having trouble finding them, you can order online, substitute frozen pie shell dough or make your own. Look for empanada shells in the ethnic frozen section of your grocery store or at Hispanic markets. You can also get them online. If you’re feeling ambitious, make your own. Preheat the oven to 375Â° and line a cookie sheet with parchment paper or foil and grease it lightly. Cut the smoked salmon into 8 even pieces. Do the same with the goat cheese. Whisk the egg and the water together in a small bowl and set aside. Now, you’re ready to stuff your empanadas. As with most dumpling-like things, you want to be careful not to over-fill them or theyâ€™ll be hard to seal and may explode in the oven. No one likes a leaky empanada! Lay out all of your shells on your work surface, then place a piece of salmon, a few spinach leaves and some goat cheese on each. Now, brush a bit of water along the inner edges. This will make the dough sticky and easier to seal. Carefully lift up opposing sides of the shell and pinch them together in a half-moon shape. You can pinch and roll them, or press fork tines into the edge â€“ really anything works as long as theyâ€™re sealed well. Place the formed empanadas on the prepared cookie sheet, making sure theyâ€™re about 3 inches apart. If theyâ€™re too close, theyâ€™ll balloon up and merge while they bake â€“ not pretty! Finally, brush each empanada with the egg wash, ensuring the tops are evenly coated. This will give them a beautiful shiny, brown surface. Bake for 30 minutes, rotating the pan once halfway through baking. Remove to a rack to cool. ohh Meli these look amazing! Your right about stuffing them with anything, you can’t go wrong. I love empanadas! This looks incredible and very original. I will make this soon.